Penn running back Trenton Horvath, stands at 5-foot-4, and he is a towering presence for the Kingsmen in terms of intensity. Horvath boasts an incredible 40-yard dash time 4.8 seconds, making him one of the fastest players on the team. That speed, plus his intensity, has made Horvath for force on the field. Horvath is not one to shy away from contact. He loves to punish opposing defensive players. “Being so short, that’s what motivates me to prove to everyone (teammates, coaches, and opposing teams) that even though I’m smaller than just about everyone else, I’m not afraid of them, and I’m not afraid to hit right back,” Horvath said. Football isn’t the only sport Horvath isn’t afraid to get hit in; he plays rugby for Penn as well. He plans to continue his rugby career in college. 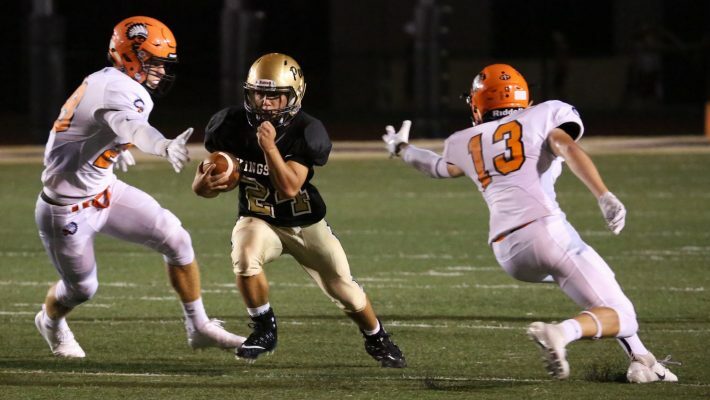 However Horvath’s main focus is on football as he tries to lead the Kingsmen to the State Championship Game for the second year in a row.